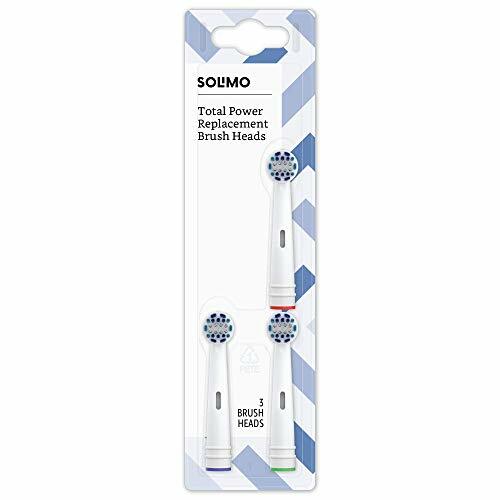 Solimo Total Power Replacement Brush Heads fits most Oral-B electric toothbrushes (does NOT fit Vitality Sonic, Oral-B Sonic Complete, Pulsonic, CrossAction Power battery toothbrush, Oral-B Complete battery toothbrush, and 3D White battery toothbrush. )‡ Oscillating brush head penetrates into hard-to-reach areas for effective cleaning while Light blue bristles fade with use to remind you when to replace your brush head. ‡Oral-B, Vitality, CrossAction Power, Oral-B Sonic Complete and Oral-B Complete are registered trademarks of The Procter & Gamble Business Services Canada Company. 3D White is a registered trademark of The Procter & Gamble Company. Pulsonic is a registered trademark of Braun GmbH.